Driven by our commitment to corporate social responsibility and guided by the principles of zero waste and the circular economy, Lexmarkâ€™s A4 CS/CX and MS/MX Corporate Cartridges further advance the sustainability innovations delivered by the Unison toner print system. The Corporate cartridges are manufactured in the EU. This ensures consistent product availability, minimises supply chain environmental impact and maintains production within the local economy. Going green has never been easier. Recycle all your used Lexmark supplies by letting us take care of the details. Itâ€™s simple, smart and always free. Essential to Lexmark print system performance, Unisonâ„¢ Toner's unique formulation consistently delivers outstanding image quality, ensures long-life print system reliability and promotes superior sustainability -- all in an innovative shake-free print system. 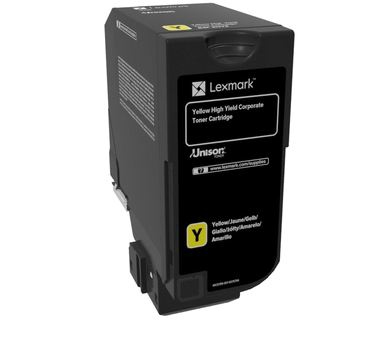 Genuine Lexmark supplies are engineered to work Best Together with your Lexmark printer, delivering excellent print quality from the first page to the last. Maximise your savings and enjoy premium quality with Genuine Lexmark cartridges. High Yield cartridges offer a lower cost per page and contain more pages than Standard Yield cartridges do. Perfect for high volume printing.